This initiative is funded by the Centers for Disease Control and Prevention (CDC) and directed by the National Association of School Nurses in collaboration with Families Fighting Flu and the National Foundation for Infectious Diseases-Childhood Influenza Immunization Coalition. This project is focused on the prevention of influenza among elementary school students (K-5). School nurses are charged with engaging teachers and families to increase their knowledge and awareness of the importance of annual influenza vaccination for everyone 6 months and older. Various communication channels are encouraged, with an emphasis on social media. Visit the Keep Flu out of School website for educational information and resources segmented for school nurses and teachers, parents and guardians, and students. Join the Keep Flu out of School online community on SchoolNurseNet where school nurses can share best practices. 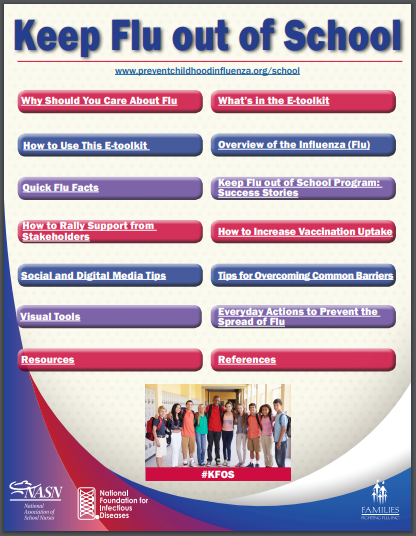 Download the toolkit below to implement a flu prevention education program in your elementary school.